Here is some news that came yesterday from Pandora’s Tim Westergren, who was a guest on the Feb. 21 edition of the Technology and the Arts podcast. Late last year I wrote on this blog that when we started Pandora we set out to do 5 things, and that we’d so far only been able to talk about four of them. Over the course of the last year, we’ve had a team developing something we call the Pandora Everywhere Platform. This is a entirely new system, that allows us to unleash Pandora from the desktop and delivery to any device, in any music format, over any network wired or wireless with capacity for 10’s of millions of users enjoying the same simple Pandora experience they’ve come to expect at Pandora.com. Janie Hermann and Evan Klimpl of the Princeton (N.J.) Public Library’s Poetry Podcast are interviewed. Other topics of discussion include the recent Digg controversy, Microsoft’s pursuit of Yahoo!, Google Sketchup, and Pete Townshend’s new Lifehouse Method music Web site. Also, a review of “Spider-Man 3.” Hosts: Brian Kelley, John LeMasney. File size: 14.5 MB. Time: 31 min., 40 sec. NOTE: We recorded most of this podcast outside so we could enjoy the beautiful weather we were experiencing in the “mid-Atlantic region.” Please forgive us for the sound of people mowing lawns and dogs barking in the background. And enjoy the special, laid-back version of the theme in the show closing! PPL Poetry Podcast – After hearing from this podcast’s guests, Janie Hermann and Evan Klimpl, visit the Princeton Public Library’s Poetry Podcast site to hear great poetry and the results of their hard work. John talks about his upcoming Brookdale Computer Users Group talk on open source software, as well as his scheduled Princeton Computer Users Group talk on his favorite Firefox extensions. Catch the Wave Gathering Festival in Asbury Park, N.J., May 18-20, featuring about 150 music acts at nearly 20 venues throughout the weekend. If you’re going to the festival, please check out past Technology and the Arts guest Christian Beach at Jake & Lucy’s at 705 Cookman Ave., Asbury Park, NJ, at 7:30 p.m. ET on Saturday (5/19). The Digg controversy: A three-way battle between Digg, its users and the good folks who bring us HD DVD (and, apparently, the DiggNation podcast). Rumors are swirling that Microsoft is trying to purchase Yahoo! If and when that happens, it will be a sad day. Want to pass some time with a cool, online, artistic tech tool? Check out Google SketchUp. View “America’s Favorite Architecture” via Google Earth (and Google SketchUp). The Who’s Pete Townshend has partnered with mathematician/composer Lawrence Ball and software developer Dave Snowdon to create The Lifehouse Method, a Web-based application that creates music. The Method allows you to ‘sit’ for a musical portrait just as if you were being painted, and the software ‘paints’ your music. Brian reviews “Spider-Man 3,” the first blockbuster of what looks like an incredible Summer 2007 movie season. Have a safe and happy Memorial Day weekend! Technology and the Arts will return with its next podcast Wednesday, June 6, 2007. Exhibitors and attendees at the 32nd Annual Trenton Computer Festival in Central New Jersey are interviewed. Other topics include Sacramento Bee photographer Renee C. Byer’s award-winning work at Pulitzer.org, a toaster pastry review at tackyliving.com, Google’s announced presentation applicationk, Wisegeek.com’s “How to make your offline life easier,” Boston Cyberarts 2007, PoliSciFi at thepartyparty.com, and musician/blogger/podcaster Jonathan Coulton. Hosts: Brian Kelley, John LeMasney. File size: 14 MB. Time: 30 min., 47 sec. Exhibitors and attendees at the 32nd Annual Trenton Computer Festival in Central New Jersey are interviewed. Other topics include Sacramento Bee photographer Renee C. Byer’s award-winning work at Pulitzer.org, a toaster pastry review at tackyliving.com, Google’s announced presentation applicationk, Wisegeek.com’s “How to make your offline life easier,” Boston Cyberarts 2007, PoliSciFi at thepartyparty.com, and musician/blogger/podcaster Jonathan Coulton. Hosts: Brian Kelley, John LeMasney. File size: 14 MB. Time: 29 min., 10 sec. Trenton Computer Festival 2007 – Technology and the Arts co-host John LeMasney gave a presentation on blogging and podcasting at the festival. Then, John and Brian walked the floor at the indoor computer show and interviewed some attendees and exhibitors. Technology and the Arts was featured in the April 26 issue of The Lawrence Ledger. The interview took place at Chuckles Restaurant in Lawrenceville, N.J., which has delicious whole wheat pizza. Brian talked about a recent Todd Rundgren concert he attended. Catch the Wave Gathering Festival in Asbury Park, N.J., May 18-20, featuring about 150 music acts at nearly 20 venues throughout the weekend. John and Brian reflect on the April 16th tragedy at Virginia Tech. Sacramento Bee photographer Renee C. Byer’s award-winning work at pulitzer.org. A toaster pastry review at tackyliving.com. Google has finally announced its presentation application. You still have a little time to catch Boston Cyberarts 2007. PoliSciFi…check out the socio-political audio-video mashups at thepartyparty.com. 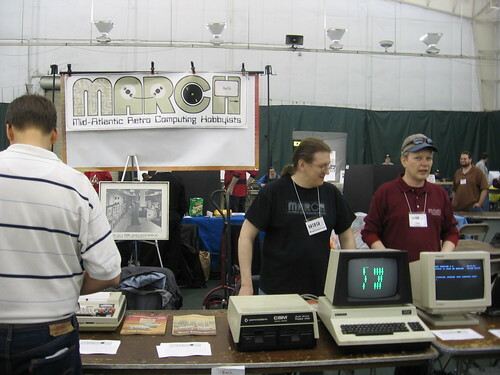 We met members of the Mid-Atlantic Retro Computing Hobbyist (MARCH) club at the Trenton Computer Festival (see photo above). MARCH is all about vintage computers…please check them out.